Brett Dean’s Pastoral Symphony is by turns tranquil and terrifying, a beautiful and passionate decrial of the destruction of pastoral idylls so lauded in 19th century music. Led by the Sydney Symphony Orchestra’s new principal conductor David Robertson, the work opens with distant sounds of natural chaos: viola murmurings, a gong and lengths of shaken aluminium foil mingle with an electronic track of recorded birdsong—a sonic forest. Piano notes drift longingly and in the vast concrete and metal space of Carriageworks the lighting design mottles like sun filtering through a canopy. 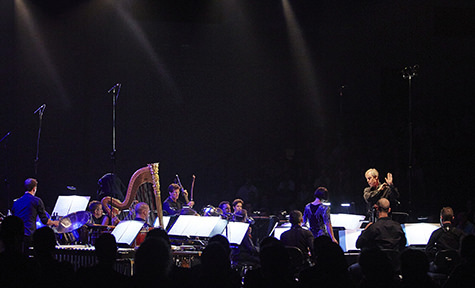 Dean is the Sydney Symphony Orchestra’s first ever Artist-in-Residence and this work was a highlight of the inaugural concert of the orchestra’s new contemporary music series in partnership with Carriageworks. The Symphony (a name chosen for its associations more than as a description of musical form) begins as a celebration of the natural sounds of the Australian bush, but there is a sense of menace. Pianist Jacob Abela leans into the instrument to strike the strings with a percussion mallet. The steady beat of axe on wood thumps through the sound system, first one tree falls, then the next. The chaos becomes more insistent, panicked even, the strings rhythmic as whip birds crack. The forest screams and goes quiet, rages and deflates. The brass cry out and before long the forest is filled with the fast snare drum rhythms of pop music and the sound of cars speeding past. The work fades out with a rattling of industrial noise and a final deep-echoing crash. The Pastoral Symphony is followed by a very different evocation of the natural world. Based on pencil drawings of seascapes by Latvian-American artist Vija Celmins, Australian composer Lisa Illean’s Land’s End is a new work commissioned by the Sydney Symphony Orchestra. Her music is hushed and understated. Strings slide delicately on the edge of hearing, the bass drum rumbles softly, the work inhabiting a liminal space on the edge of silence. The use of a sheet of aluminium foil as an instrument is a visual as well as aural motif linking Land’s End to Dean’s Symphony. A creeping sonic figure softly crosses the ensemble over gently weeping pitch-bends. Microtonal tunings create a mildly unsettling dissonance that threads through the work. The sound-world is so fragile that small gestures gain enhanced significance; glissandi become soft tears across the fabric of the orchestra’s sound. A gentle lapping conjures the movement of tides and waves, before the music evaporates like steam. The soft hiss of bass drum skin opens the first movement of Gérard Grisey’s Quatre Chants pour Franchir le Seuil (Four Songs for Crossing the Threshold). Like Land’s End, Grisey’s Quatre Chants… brushes the borders of sound and silence, but here the chilling effect of the almost imperceptible entry is disfigured by a wash of lighting, the border between darkness and light awkwardly well-defined. 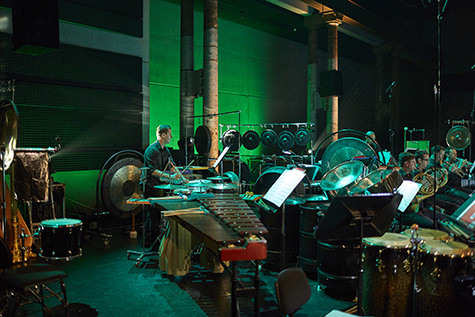 Grisey’s final work—the last before his unexpected death from an aneurysm at age 52—employs Javanese gongs and, like Illean’s work, microtonal tunings. The first song, La Mort de l’ange (The Death of the Angel), is a setting of poetry by Christian Guez-Ricord. Chicago-based Australian soprano Jessica Aszodi’s articulate, accented interjections and soft sustained notes give the grief of the text a disturbing clarity. Her keening voice reaches out to that of the trumpet, their timbres mingling. Hissing skin decorates the silence between movements, Grisey’s “insubstantial musical particles intended to maintain a level of polite but slackened silence” (program notes). In La Mort de la civilisation (The Death of Civilisation), a setting of Egyptian sarcophagus inscriptions, a repeating plucked figure in the harp proceeds solemnly. La Mort de la voix (The Death of the Voice) opens with bell-like chiming and jagged soprano line, high violin notes disintegrating into bright shards. The interlude between the third and fourth movements is a threatening rumble and hiss before the cataclysmic climax of the work, La Mort de l’humanité (The Death of Humanity). The text Grisey set for his final movement comes from the ancient Mesopotamian poem The Epic of Gilgamesh, and depicts an apocalyptic flood: “Squalls, Pelting rains, Hurricanes.” Brushes on the bass drum mutter of rain, thunder rolls across the percussion section and cries of violin, piccolo and piccolo trumpet rend the air. Aszodi screams above the carnage, delivering her lines with jabbering, unhinged vigour. A bass drone introduces the work’s denouement: a cathartic lullaby from Aszodi to an uneven, swaying accompaniment. There is a sense of peace. It is, as Grisey writes, “music of the dawn of a humanity finally unencumbered by nightmare” (program notes). The program opened with a late addition: Pierre Boulez’s Dérive 1, in memory of the composer who died in January this year. Robertson, a colleague of Boulez, conducted a small ensemble of musicians from the SSO who, along with French pianist Pierre-Laurent Aimard—appointed by Boulez as Ensemble InterContemporain’s first solo pianist—deftly navigated Boulez’s trill-laden fluttering and crisp subito dynamic changes. Crossing the Threshold was a beautiful, challenging and elegantly programmed tribute to both Pierre Boulez and new music more broadly; the sell-out crowd a vindication of David Robertson’s vision and an encouraging sign that Sydney can sustain, indeed craves, more of this kind of concert. The second of the two concerts for 2016, on 20 November, is titled Oblique Strategies. Conducted by Brett Dean, it will feature works by Steve Reich, Frederic Rzewski, Dean himself and premieres from Australian composers Natasha Anderson and Alexander Garsden.